Western blot analysis of extracts from HeLa cells, transfected with 100 nM SignalSilence® Control siRNA (Fluorescein Conjugate) #6201 (-) or SignalSilence® Bad siRNA I (+), using Bad Antibody and p42 MAPK Antibody #9108. 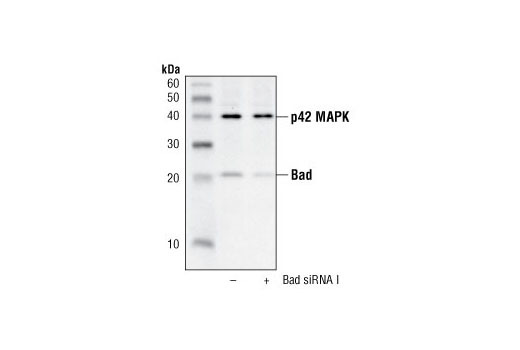 The Bad antibody confirms silencing of Bad expression, while the p42 MAPK antibody is used to control for loading and specificity of Bad siRNA. Western blot analysis of extracts from HeLa cells, transfected with 100 nM SignalSilence® Control siRNA (Fluorescein Conjugate) #6201 (-) or SignalSilence® Bad siRNA II (+), using Bad Antibody and α-Tubulin (11H10) Rabbit mAb #2125. 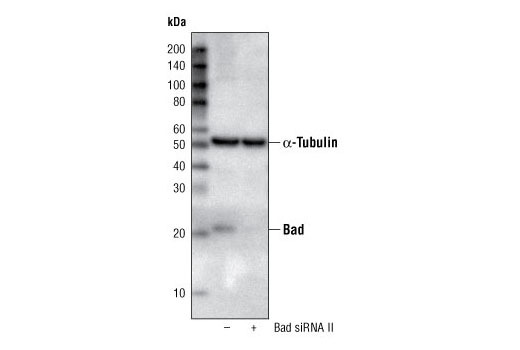 The Bad antibody confirms silencing of Bad expression, while the α-Tubulin (11H10) Rabbit mAb is used to control for loading and specificity of Bad siRNA. Western blot analysis of extracts from COS cells, untreated or TPA-treated, using Bad Antibody (right) or Phospho-Bad (Ser112) Antibody #9291 (left). 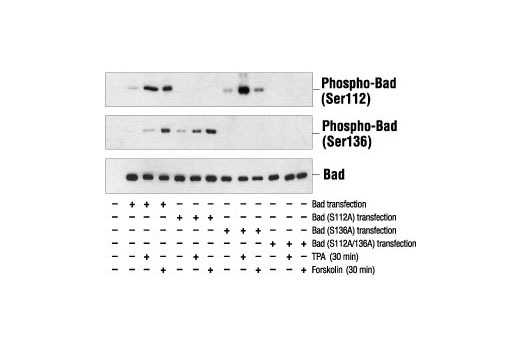 Western blot analysis of extracts from 293 cells transfected with Wild-type Bad, Bad (Ser112A), Bad (S136A) or Bad (S112A/S136A), untreated, TPA-treated or forskolin-treated, using Phospho-Bad (Ser112) Antibody #9291 (top), Phospho-Bad (Ser136) Antibody #9295 (middle) or Bad Antibody (bottom). 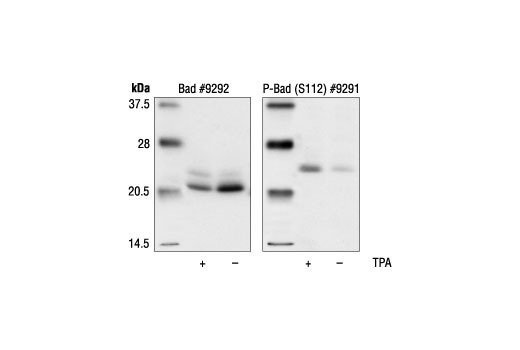 Bad Antibody detects endogenous levels of total Bad protein. The antibody does not cross-react with related proteins. Polyclonal antibodies are produced by immunizing animals with a synthetic peptide corresponding to residues surrounding Ser112 of mouse Bad. Antibodies are purified by protein A and peptide affinity chromatography.